On Monday's Countdown show, MSNBC host Keith Olbermann used his regular "Worst Person in the World" segment to accuse the Chairman of the Joint Chiefs, Admiral Michael Mullen, of trying to "fake" a "Gulf of Tonkin" incident with Iran over the recent U.S. Navy confrontation with Iranian navy speed boats in the Strait of Hormuz. 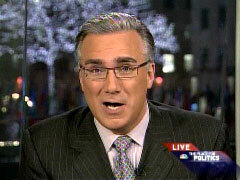 Referring to reports that, out of five Iranian boats, only one unarmed boat approached the U.S. Navy ships, and that the threatening message received could have come from a "well-known marine heckler" of the area, Olbermann awarded the "Worst Person" dishonor to Mullen: "So you guys tried to fake another Gulf of Tonkin incident using some clown with a CB radio and the lethal threat posed by the S.S. Minnow? 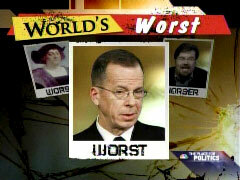 Joint Chiefs Chairman Mike Mullen, on behalf of the Bush administration, today's 'Worst Person in the World'!" KEITH OLBERMANN: Our winner, your friendly U.S. government, epitomized here by Chairman of the Joint Chiefs Mullen. This is about the little thing in the Straits of Hormuz, which the administration tried to sell as a near act of war by Iranian patrol boats against three giant U.S. warships, complete with provocative maneuvers and somebody radioing the U.S. ships, quote, "I am coming to you. You will explode after minutes." Admiral Mullen, it was, who said of the video of the incident, "To my knowledge, I have not seen one as both provocative and dramatic as this." Five minutes later, though, he added: "First of all, I haven't seen the full video myself." Now, the Navy Times newspaper echoes a lot of online reporting saying that the threatening radio message may have come from a well-known marine heckler whose radio abuse is legendary around the Persian Gulf. Oh, and that the only Iranian boat that actually came close to one of the U.S. warships was unarmed. So you guys tried to fake another Gulf of Tonkin incident using some clown with a CB radio and the lethal threat posed by the S.S. Minnow? Joint Chiefs Chairman Mike Mullen, on behalf of the Bush administration, today's "Worst Person in the World"!